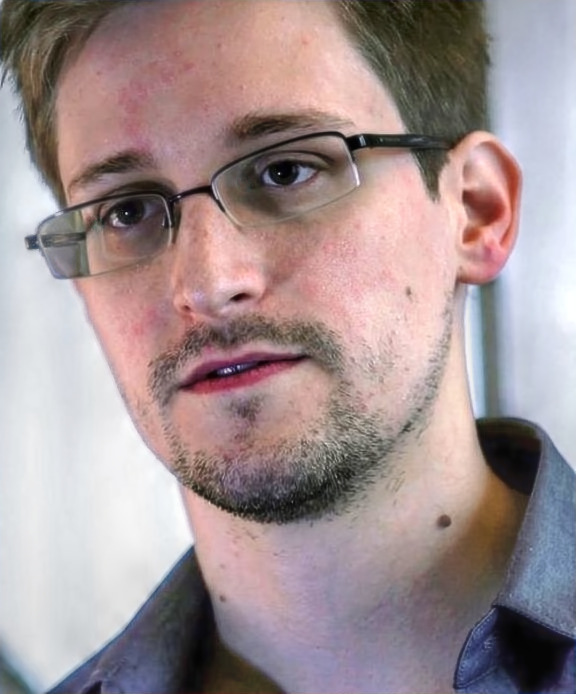 エドワード・スノーデン「声なき人間になるくらいなら国なき人間になる」　Edward Snowden: I Would Rather Be without a State than without a Voice. 新基地は「海にも陸にも作らせない」との一貫した姿勢を貫く名護市の稲嶺進市長から仲井真知事への抗議文を紹介する。画面で読みにくいかもしれないのでテキストを下方に貼付。 Here is a letter of protest from INAMINE Susumu, Mayor of Nago City to NAKAIMA Hirokazu, Govenor of Okinawa, against Nakaima's approval of the government's request to reclaim Henoko, where the US and Japanese governments are planning to build a new air base with a military port, as a replacement facility of Futenma Air Station (See report from Asahi). See below for an English translation. Today, the Governor of Okinawa approved the request for reclamation of a body of public water at Henoko, Nago City, for the construction of a replacement facility of Futenma Air Station. The Governor, who had been spearheading the "All-Okinawa" movement for moving the base outside of Okinawa, suddenly changed his position and approved reclamation. The Governor's turnabout again pushed Okinawan people, who had believed his strong word, down to the abyss of disappointment. In the Governor's meeting with Prime Minister Abe, his words like "I am grateful, on behalf of 1.4 million Okinawan people," and "Now I can look forward to a good New Year holiday" were too inconsiderate. It amounted to an utter breach of trust against the people of the prefecture, who had strong expectations of the Governor. 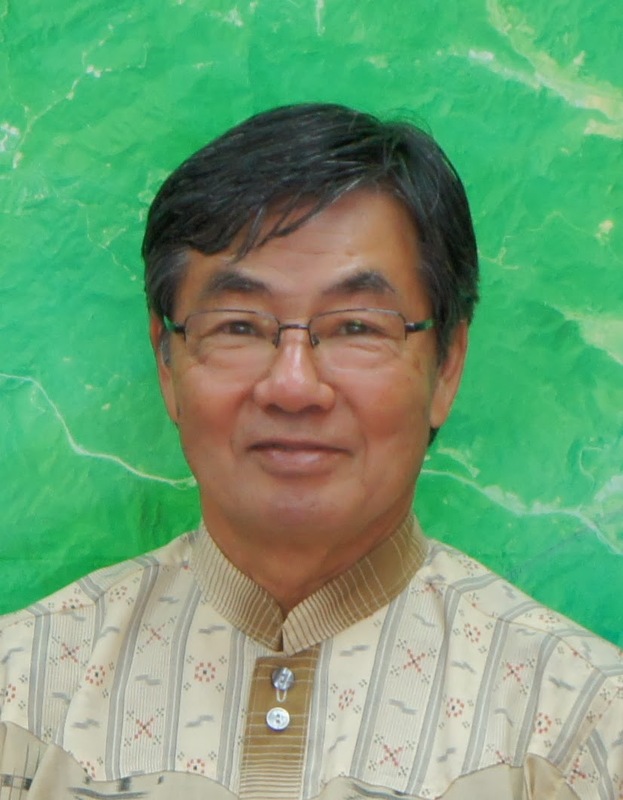 It has been pointed out that the process that led to the reclamation request, which was the Environmental Impact Assessment, has had many flaws as I noted them in the Nago Mayor's Opinion Statement. The flaws included the addition of the planned deployment of MV-22 Osprey in a later stage of the Assessment, and the lack of multi-year survey of the dugong in the area. 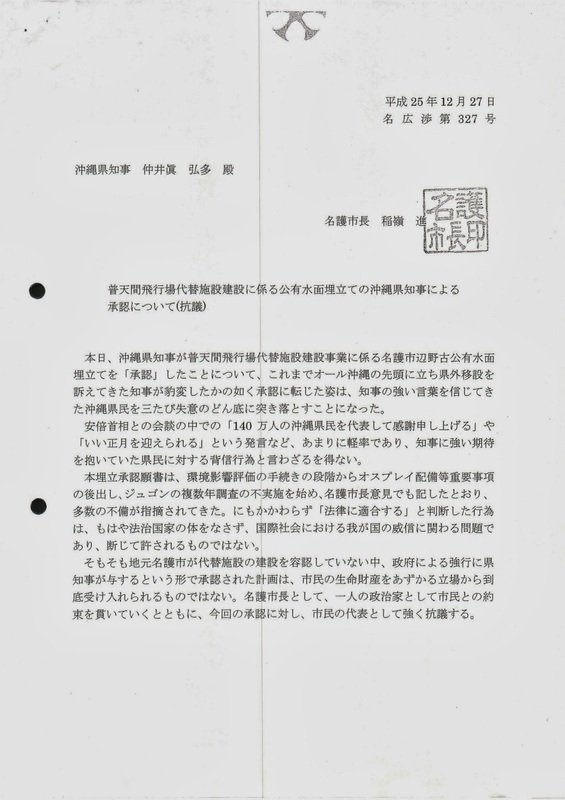 The fact that Governor regarded the reclamation application as "legally compatible" despite these flaws means that Japan is no longer a nation ruled by law. It raises a problem about the dignity of our nation in the international community, and therefore it is absolutely unforgivable. The reclamation plan was approved in the manner that the Governor of Okinawa sided with the government that tries to force the construction of the replacement facility, even though Nago City, where the construction is planned to take place, does not approve it. It is absolutely unacceptable, from my position where I am responsible for the lives and assets of people of Nago. 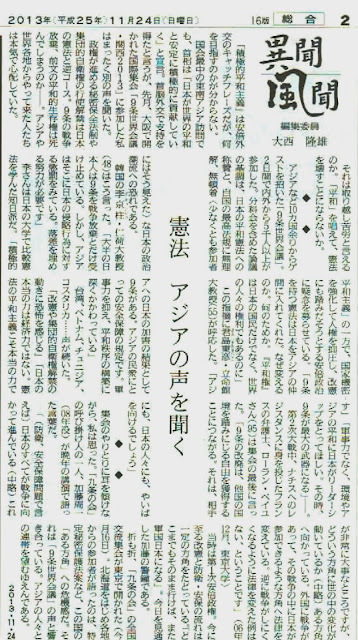 I stand firmly by my promise with the citizens, as Mayor of Nago, and as one politician, and at the same time, I, as a representative of citizens, strongly protest the reclamation approval by the Governor. Japan is a valued ally and friend. Nevertheless, the United States is disappointed that Japan's leadership has taken an action that will exacerbate tensions with Japan's neighbors. The United States hopes that both Japan and its neighbors will find constructive ways to deal with sensitive issues from the past, to improve their relations, and to promote cooperation in advancing our shared goals of regional peace and stability. We take note of the Prime Minister’s expression of remorse for the past and his reaffirmation of Japan's commitment to peace. ニューヨーク・タイムズ社説で安倍政権批判－「日本の危険な時代錯誤ぶり」 New York Times Editorial Criticizes Japan's "Dangerous Anachronism"
NEW YORK—The Open Society Justice Initiative has expressed its deep concern over the provisions of Japan’s new state secrecy law, expected to be adopted by the country’s parliament on Friday. Sandra Coliver, senior legal officer at the Justice Initiative, noted that the new law falls far below international standards in setting strict limits on the public’s right to know about national security and national defence issues. 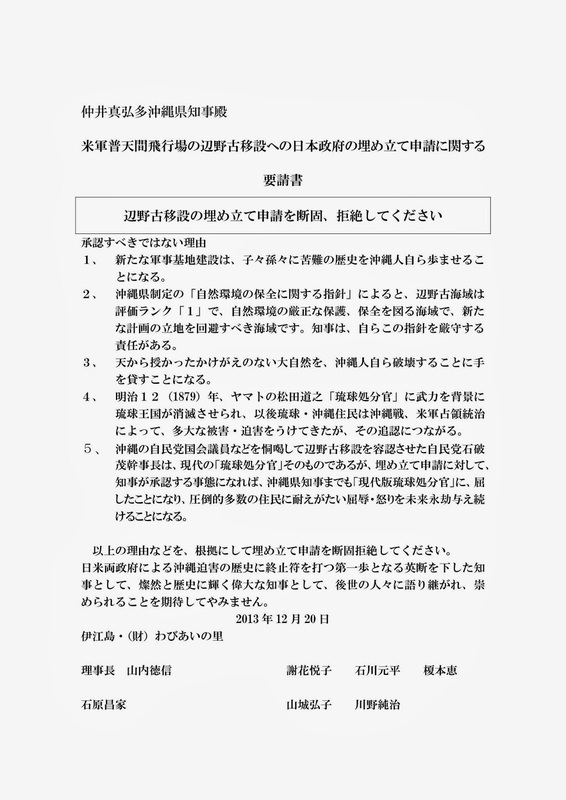 · It would dramatically extend current powers under a 2001 law that empowers the Minister of Defence to keep confidential information “especially necessary to be made secret for Japan’s defence.” The new bill would extend this power to several vague and over-broad categories of information, including defence, diplomacy, “designated dangerous activities,” and prevention of terrorism. · The list of government entities empowered to designate information as secret would be expanded beyond the Defence Ministry to include every cabinet ministry and major agency of the government. · The maximum penalty for disclosure of classified information would be increased to 10 years imprisonment from 5 years under the 2001 law. · It does not include a “public interest override,” that would allow disclosure if the public interest in the information outweighs the likely harm from disclosure. · It fails to include a public interest defense. This provides that a person who leaks information of high public interest should not be subject to criminal penalties if the public interest in the information is greater than the actual harm caused. In all these areas, the law falls far below international standards and best practice, as reflected in a set of global principles on national security and the right to information, called the Tshwane Principles, which the Justice Initiative helped draft. The Tshwane Principles are based on international and national law, standards and good practices, and are reflected in the laws of modern democracies as well as decisions of regional courts. They were drafted by 22 organizations and academic centers from around the world, in consultation with more than 500 experts, including with security sector, intelligence and diplomatic experience. They have been endorsed by the Parliamentary Assembly of the Council of Europe, the relevant UN special rapporteurs, and the special rapporteurs on right to information or freedom of expression of the Inter-American and African human rights systems. The principles recognize that the government is justified in keeping sensitive information from the public for periods of time, as long as secrecy decisions are necessary to protect against an identifiable harm and are periodically reviewed. The Japanese bill does not meet this standard. Prime Minister Shinzo Abe has repeatedly declared that the need for a tougher secrecy law is indispensable to his plan to create a National Security Council based on the American model. Japanese newspapers have also reported that U.S. officials have pushed Japan to tighten its secrecy regime. But several close U.S. allies allow public interest considerations in classification decisions, have maximum penalties of five years or less for unauthorized disclosures of classified information, permit designation of state secrets by fewer ministries, and have processes by which secrecy designations can be challenged before the courts and/or other independent bodies.